The CDE-171 series CD receivers offer just what you need. Play your iPod or iPhone via USB (cable sold separately) and control music playback and search functions right from the head unit. Alternatively you can also switch to Direct Control Mode and control playback from the iPod and iPhone directly. The convenient USB port with 1000mA charging support and 3.5mm auxiliary input on the front of the unit allow you to easily hook up USB flash drives or an MP3 player. of your iPod or iPhone. Along with superior sound quality and easy operation, you also get quick music search via song, artist, album, and other choices. The faster your iPhone charges, the better! These head units provide a fast-charge function to a maximum of 1 Ampere, for quick recharging of your iPhone battery. Because these head units support a 1 Ampere power supply, you can connect and power portable hard disks. This makes it possible for you to enjoy your whole music library inside your car. These head units offer a built-in equalizer with 10 pre-sets. You can quickly switch between the settings to find the sound that you prefer with the type of music you're listening to. There's also a 3-band parametric EQ, for further sound customisation. With Alpine's App Direct function, you can now listen to music from any iPhone app through your car speakers. 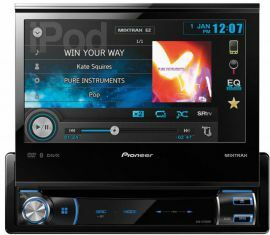 Enjoy stored music, Internet Radio and more. This product was added to our catalog on Tuesday 26 February, 2013.